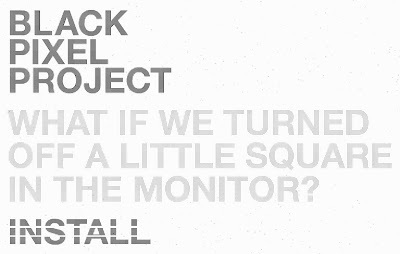 Greenpeace Brazil have just launched a great new campaign called ”Black Pixel Project” to promote the energy saving potential of turning off a single pixel on your computer screen. The campaign, which has been created by Almap BBDO, is based on users installing a simple little program that creates a single black pixel over all the windows on your monitors. For convenience the pixel can be moved around. Users also have the option to view real time stats about how many people are using the program and how much energy is being saved. The campaign objective is to show that for every pixel installed, a few watts of power are saved. Unfortunately it doesn't work on LCDs, only CRTs and Plasmas. There is also significant debate as to whether this really works on CRTs or plasmas. Tests have shown that the original thinking behind black screen power saving may be flawed - also any saving from one black pixel will possibly be outweighed by the energy required to serve up the YouTube video? I have written about some of the contradictions here Black Pixel does it actually work? Hey Nick - I hadn't seen that article, very interesting reading. It makes a lot of sense that there may be no real power saving at all. Plus it also occurred to me that there must be additional energy requirements to run the Black Pixel site, and to have developed the site and program. I wonder what off-set they're claiming?